It officially went into effect October 3, 2015. 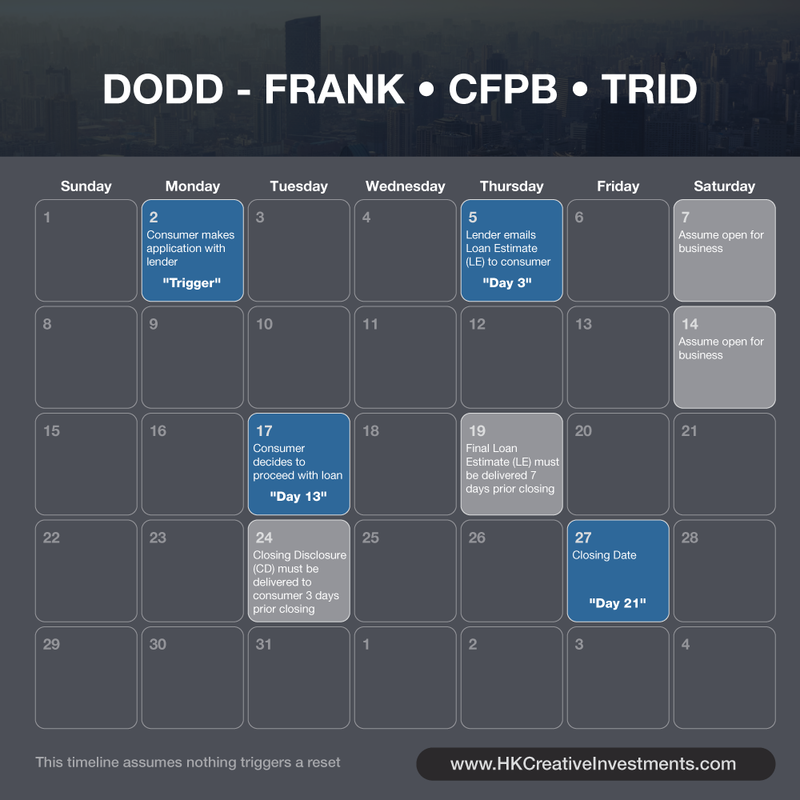 The Dodd-Frank mandated (CFPB directed) residential real estate closing regulation (known as the “TRID Rule”). If you’re participating in a residential real estate transaction in America, then these closing rules shall apply. This federal ruling has only to do with how lenders deal with borrowers/buyers. As such, all-cash sales are exempted from this timeline; because with all-cash, no mortgage loan is being used to buy the property. Also, commercial real estate closings aren’t applicable here either. Ultimately, if a residential property buyer is using any sort of financing (including seller financing) to buy a residential property in the United States, then this Federally mandated timeline is required. And must be acknowledged by all participants in the transaction: the seller, the buyer, the broker, the attorney, the title company and the lender’s alike. Before we reveal the actual timeline, let’s further simplify this hurricane of government confusion. In a nutshell, the processing of these two documents is what you must faithfully remain aware of: (1) the Loan Estimate and (2) the Closing Disclosure. All of the previously required closing disclosure documents (like the HUD-1 for example) have now been consolidated into these two new documents. And any errors and/or changes to either the Loan Estimate or the Closing Disclosure shall cause a reset at the related point in the closing timeline. Everything starts when an application is considered an application. When isn’t an application an application? When these six (6) items are tendered—and officially in the possession of the lender—this constitutes an application and triggers the timeline. If you recall, a moment ago we mentioned the two documents: Loan Estimate (LE) and Closing Disclosure (CD). Furthermore, we’re now aware that a loan application triggers the real estate closing time-clock. So let’s explain where these two documents actually fit in the timeline. For starters, the way the regulation is written, the lender must provide the Loan Estimate to the consumer (borrower!) within three business days of application trigger. Therefore, after the lender has received all six items mentioned above, the lender must have mailed the Loan Estimate (LE) out within three (3) business days. Let’s assume now that the consumer (borrower) instantly received and acknowledged the Loan Estimate because the lender sent it via e-mail. From the moment the consumer (borrower) is presumed to have received the application, the consumer now has ten (10) days to decide whether to proceed with the loan; or not. A lender cannot charge a buyer (borrower) for an appraisal until the consumer evidences intent to proceed with the mortgage. Repeat: a lender cannot charge a fee except for the credit report; until after a consumer has received a Loan Estimate and has decided to proceed with the transaction. Simply stated, the Loan Estimate is how a consumer will apply for a loan. When the consumer (borrower) decides to proceed, the lender will get rolling with the final appraisal. The Closing Disclosure captures all the costs paid by the consumer. It replaces the old HUD-1. And the consumer must receive the Closing Disclosure three business days prior closing. 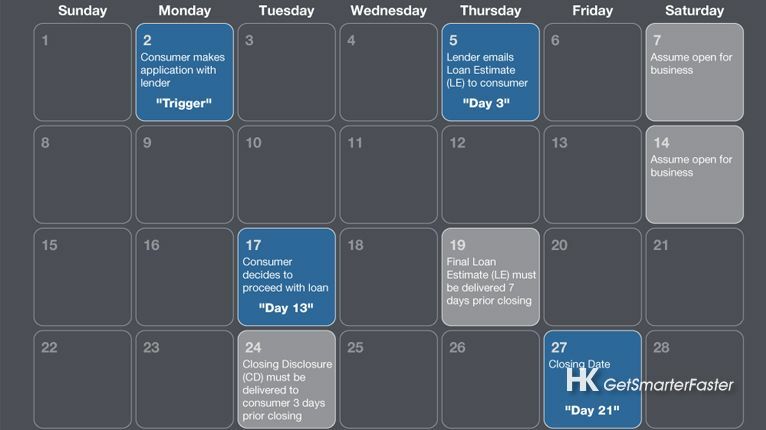 In a sense, there’s now a mandatory three-day waiting period between the closing day; and the day the consumer (borrower) received the Closing Disclosure. Repeat: the Closing Disclosure must be delivered no later than three (3) days before closing. And one final delivery item that you must consider is that the Final Loan Estimate must be delivered at least seven (7) days prior closing. In States where an attorney review period is a condition of the real estate contract, it’s possible that a new Loan Estimate will be required as a response to deal changes between the buyer and seller during the attorney review period. One way or another, when it’s all said and done, the Final Loan Estimate must be delivered at least seven (7) days prior to closing. Ultimately, the Closing Disclosure is the document that will determine whether the estimates outlined in the Loan Estimate were made in good faith. If one of the estimates falls outside tolerance limits, it can trigger a reset of the closing 3-day rule. The point to nail down is that real estate brokers and attorneys should have the paperwork in the custody of the title company 1-2 weeks before the closing date. Furthermore, clients (consumers) should abide by their Contract Agreements; with no last minute negotiations. As an example, sellers shouldn’t remove items (fixtures!) in the last minute that would require new lender approval. And buyer’s should do a final walk-thru early enough to allow for changes. If you’re borrowing money to buy a residential property in the United States, this basically sums up what the powers-at-be require. Yes, there are other technical nuances; but leave that to your advisor and the lender. If you’re buying or selling property alone, or if you’re extending credit (lending!) to a borrower for a consumer loan, then here’s some subtle technical stuff to be aware of with the TRID ruling. Technical item #1: pre-approvals and pre-qualification letters from a lender are still allowed. However, expect a lender to only collect certain items so they don’t trigger the application. For instance, a lender might only request borrower Name, Income & Social Security to reveal the maximum loan size a borrower would have access to—without making any reference whatsoever to the property or property values. Technical item #2: in their infinite wisdom, the government regulators provided two definitions for what constitutes a “business day.” Firstly, regarding the first 3-day Loan Estimate (LE) benchmark, Saturday’s are only considered a “business day” if the lender is open for business on weekends. Therefore, if a borrower submits all six (6) application items to a lender on a Friday, then Saturday would not count toward the mandatory 3-day Loan Estimate deadline; if that lender wasn’t open for business on weekends. But, if the lender was open for business on Saturday, then Saturday would count as one of the days in that 3-day Loan Estimate period. Confusingly, regarding the Closing Disclosure—business days always include weekends. No matter whether the lender is open for business on weekends; or not. When it comes to the Closing Disclosure, weekends do get counted. Technical item #3: the government regulators have limited the tolerance for cost changes when comparing amounts quoted in “good-faith” on the Loan Estimate; to what’s presented on the Closing Disclosure. If there’s a large enough discrepancy (tolerance violation) between the Loan Estimate and the Closing Disclosure, the lender may have to refund to the consumer certain amounts. Additionally, there are three big items that automatically trigger a reset of the 3-day rule altogether. One, if the loan’s APR% changes. Two, if the loan product itself changes (e.g. you’re going from a fixed-rate to an adjustable rate). Three, if the loan previously did not contain a prepayment penalty—and later, a prepayment penalty was added. Technical item #4: Within thirty (30) days after the closing date (“post-closing”), lenders would have to send a revised Closing Disclosure reflecting the actual costs of the closing. And any monetary refunds to the borrower must be made within sixty (60) days of the closing completion. In summary, the Truth-in-Lending Act/RESPA Integrated Disclosures (“TRID”) creates timing requirements for the disclosures that lenders must make to consumers. Additionally, the CFPB has stated that the lender (not the broker, nor the attorney) is ultimately responsible for any errors regarding all the closing paperwork. 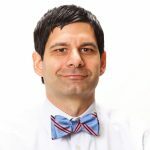 Therefore, because of the additional liability imposed on the lender, it’s unlikely that lenders would tolerate any last-minute changes with residential real estate transactions. Notwithstanding the fact, that any flaws in complying with these rules will impair the lender’s ability to traffic (sell!) the mortgage to the secondary market. 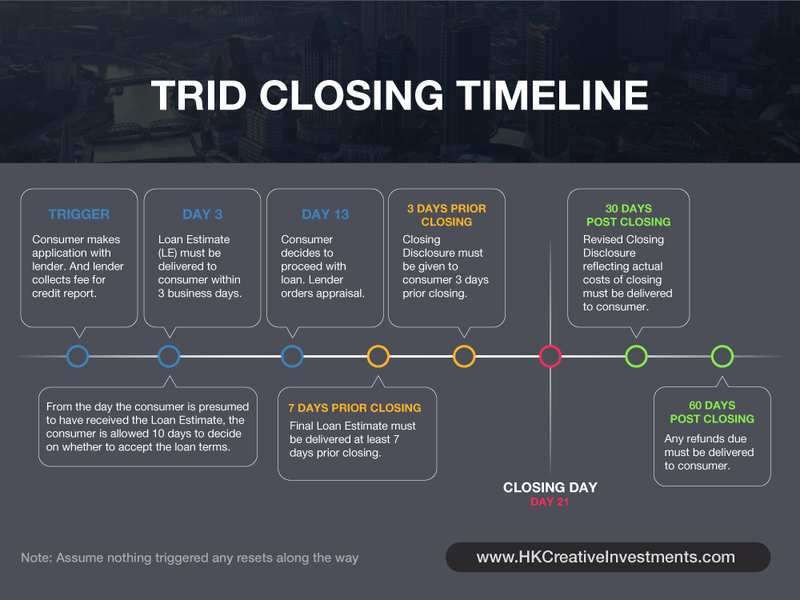 If a mortgage is involved in your residential real estate transaction, expect that it could take longer to close because of TRID’s mandatory timeline rules. Nevertheless, we’ll safely guide you when you: buy downtown Chicago luxury property here.